When a national government depends upon income from oil & gas to balance its budget, the prices of oil & gas become very important to the economic health of that country. When oil-state governments grow financially over-extended through greed, corruption, ambition, or desperation, fiscal breakeven oil prices rise — even if market oil prices fall. The fiscal break-even oil price is the average oil price which is needed for an oil exporting country to balance its budget in a particular year. It is an important metric for a country’s fiscal vulnerability to oil. If the break-even price is higher than the market price budgets cannot be balanced. In general, fiscal breakeven prices for national governments are calculated in the same approximate way as “breakeven points” are calculated for small businesses, but in reality the process is more complex and imprecise. These numbers are estimates, and can never be known precisely due to the built-in ambiguity and intentional deception (corruption, “skimming”) within the record keeping apparatus of oil state governments. In general, fiscal breakeven will be kept inside limits by adjusting expenditures. But under a leader with enormous political ambitions — such as Putin or the late Hugo Chavez — a government may abandon prudent fiscal limits for short-term political expediencies. 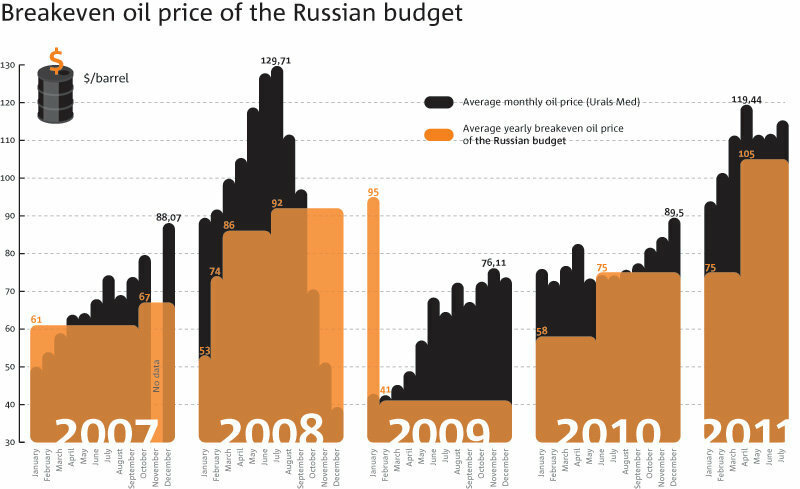 The break-even oil price, at which Russia’s budget balances, has rocketed from just $34 a barrel in 2007 to $117 this year. Putin’s political ambitions know no bounds, and neither apparently do his spending goals. 2012 estimates for Russia’s fiscal breakeven revolved around the $120 mark. But since then, Putin has ratcheted up both government spending and political payoffs to cronies. The value of the ruble has fallen, and the near-term future of the Russian economy is in limbo — waiting to see which way oil & gas prices will swing. All because Putin chose not to diversify Russia’s economy in the good times, and made the national economy even more dependent on energy exports. 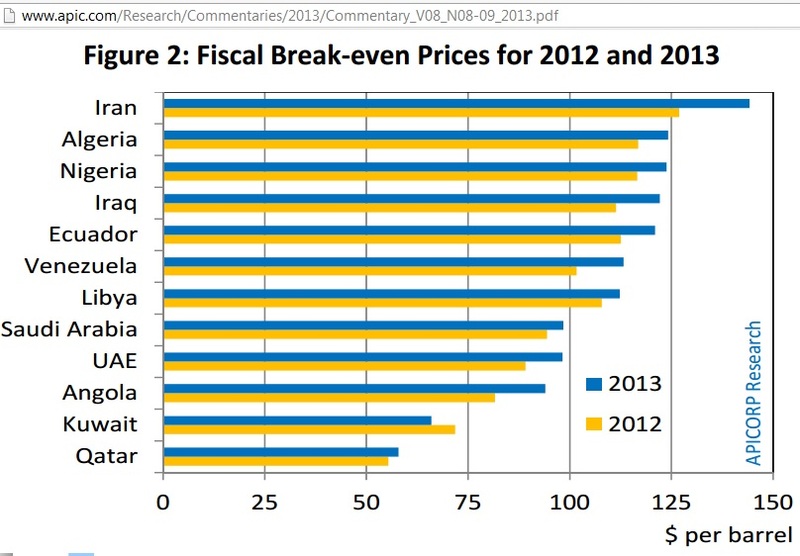 Some 2014 fiscal breakeven estimates for OPEC nations Saudi fiscal breakeven rises. New pipeline from Azerbaijan a threat to Putin. Will Tsar Vlad invade Azerbaijan as well? Or will he complete his invasion of Georgia to block the new pipeline? Europe can react to Putin’s “energy slavery” agenda by increasing nuclear energy, increasing the use of coal, decrease the use of Russian gas, increase importation of LNG from elsewhere, begin production of European natural gas, or choose from a number of other options. In economics, every action provokes a reaction of some type. More: Given the choice, Putin would prefer to drive global oil prices higher, rather than to scale down his ambitions of empire. Putin must keep his neo-oligarchs happy while pushing the expansion of the neo-Imperialist Russia. By promoting violence across multiple parts of the world — from Syria to Ukraine to Afghanistan to Iran and beyond — Putin helps to support global oil & gas prices while keeping potential adversaries from gaining ground. Putin’s ongoing cold war was based upon the certainty (in his mind) of ever-higher oil & gas prices. As Putin’s props start to fall away, changes in the Kremlin may be necessary. As discussed above, such estimates have to be taken with a grain of salt. In this case it is virtually certain that the Russian fiscal breakeven estimate is low by at least 20%. Anyone who believes that fiscal breakeven is lower than it was in 2012 ($120 bbl) now that Putin has broken the bank with the combination of Sochi, Putin’s wars, and Putin’s upshift in defense spending, spy and propaganda budget, and payoffs to cronies and civil service workers, has been sleepwalking on the job. In the case of Deutschebank, the underestimate is likely to be intentional, and for political financial reasons. 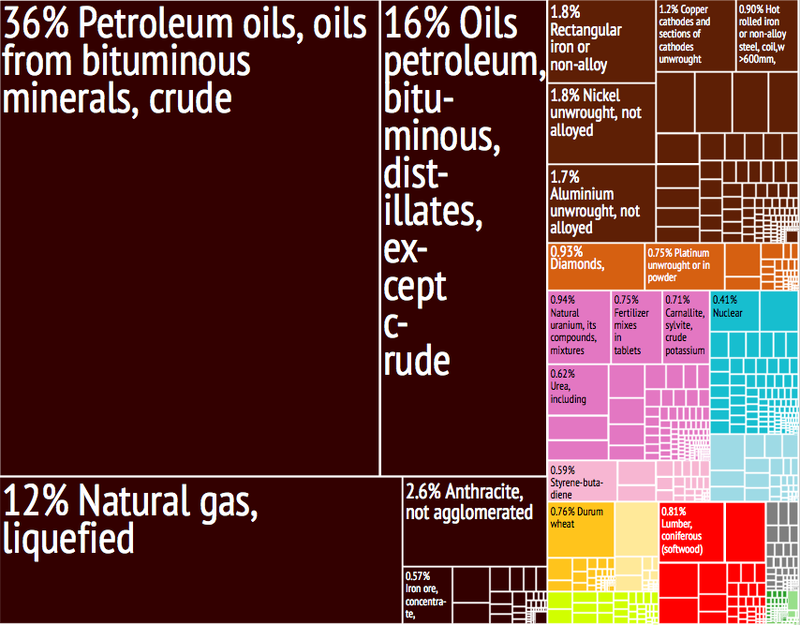 Update October 2014: How do oil producers balance their books? 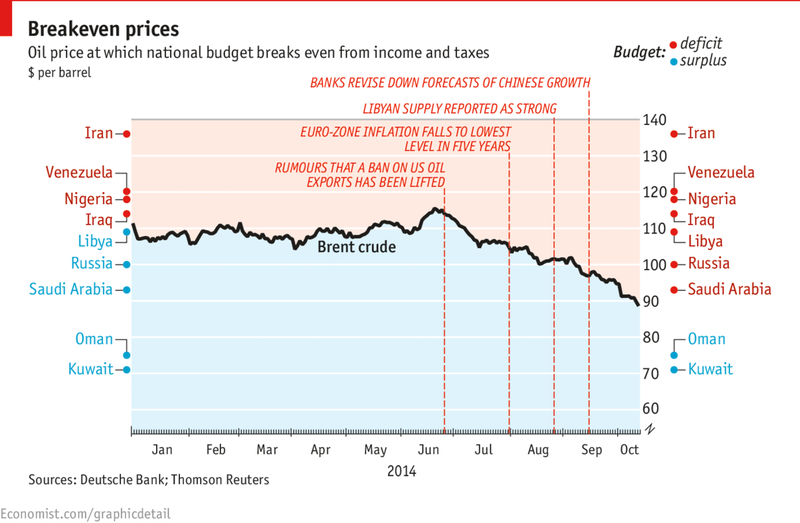 Estimates for Russia’s fiscal breakeven range between $100 bbl and $150 bbl. Since the actual figure is a moving target that shifts upward with every new expenditure, and downward with every cut in the budget, total precision is impossible. In fact, not even Putin knows. Nor does he seem to care, at this point. More fuzzy thinking at Deutsche Bank in its breakeven estimates for Russia After all the new spending in Russia, and the new spending obligations, nobody believes the $100 bbl breakeven number for the Kremlin budget. No wonder Germany is doing so badly if all the financial thinking in the country is so sloppy. And BTW Germany, dump the green energy delusion before it buries you. 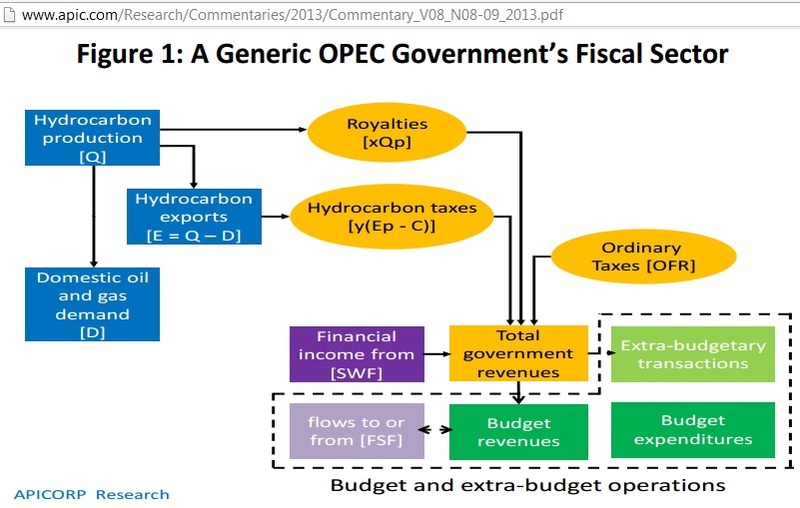 This entry was posted in Economics, Energy, Oil Prices, Oil Prices Fiscal Breakeven, Russia and tagged Fiscal Breakeven. Bookmark the permalink.